Here I am, finally posting about our Valentines Day dinner. We (well, me) decided to stay in as we’ve had bad luck with restaurants lately, with our spending a lot of money on less-than-spectacular dishes. So, I figured that we could save some money by cooking at home, and still have a great meal. I spotted this recipe on Epicurious.com, and adapted it slightly based on user comments. 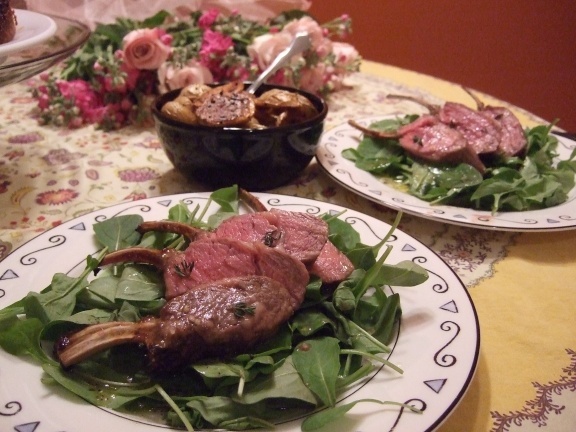 The result was fantastic: the lamb was tender and flavorful, with a hint of sweetness from the honey glaze. And the arugula — I’m still thinking about it. The peppery bite from the greens is off-set by the honey garlic vinaigrette and pairs with the lamb beautifully. One change I might make in the future is lightly searing the lamb before roasting it in the oven. I think the chops could have used a bit more color, and searing should take care of that. Of course, this would likely change the roasting time, so if you do this, make sure to keep an eye on the meat. (And how did we celebrate Valentines’ Day? While the lamb roasted, we exchanged gifts. I gave Shane a French coffee press, and Shane gave me a bouquet of flowers and chocolates — as requested. Then we had our lamb, complemented with roasted potatoes and capped off by pineapple-upside down cake. Preheat oven to 425-degrees F. Combine honey, 1 tablespoon oil, thyme, and garlic in heavy small saucepan. Stir over low heat until just warm, then remove from heat. Pour 2/3 of honey mixture into small bowl. Place lamb on rack set in roasting pan; brush with half of honey mixture from bowl. Roast lamb 12 minutes; brush with remaining honey mixture from bowl. Continue to roast lamb until an instant-read thermometer inserted into thickest part of meat registers 125-degrees F for medium-rare, about 10 minutes. Transfer lamb to cutting board. Meanwhile, add vinegar, 1 tablespoon water, and remaining 3 tablespoons oil to honey mixture in saucepan. Stir over low heat until just warm. Discard thyme sprigs and season with salt and pepper. Cut lamb between ribs into chops. Divide arugula among plates. Top each serving with lamb chops. Drizzle warm dressing over and serve warm.